1. Is experience needed for kart racing? You will not need to be familiar with professional racing to enjoy karting. Every person is informed about the meanings of signs, flags and rules of the track for safety. 2. At what age should one be able to race? There are requirements concerning adult karts. Children must be at least 4.3 feet in height and over 10 years of age. Also, if you aren’t certain you’re skilled enough for kart racing, then you can take an assessment. This is known as a race evaluation. You are eligible to race as soon as you’ve passed the evaluation. The evaluation permits track personnel to inform you of specific road rules. They will brief you on driver safety and help to ensure that you’re compliant with basic road safety. 3. Are there any waivers that I have to sign? In some states, signing a waiver for kart racing is always going to be a requirement. Your signed waiver benefits you so that you can receive insurance coverage for yours and the track’s protection. Most Kart racing facilities also allow you to bring your own helmet. To be permitted for use, the helmet must meet DOT requirements. It should come attached with a pair of goggles, a visor and a frontal shield that is able to cover most of the face. 4. Are Go Karts really that fast? 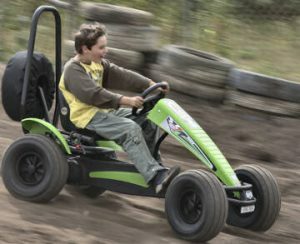 Most go-Karts available standard for indoor use are quite fast. The industry doesn’t sacrifice speed in order to make karts safe. Most karts have an electric motor with a horse power of 24(hp). This makes your kart be able to hit speeds of at least 45 MPH. 5. Is there any training for go kart racing? Although there is no racing experience needed, many who plan on going karting, may undergo a brief safety evaluation. Going over kart track rules will help drivers to better grasp each sign’s meanings as well as inform them on how to safely drive the kart. In most cases this evaluation is a requirement. 6. Is it necessary for me to make a reservation? Reservations are not used much, especially if you’ll only be racing with a small group of three to four people. You’ll probably still not be needing one if your group included you and six others. Pre-planning is not highly suggested because most tracks operate on a first come, first served basis. 7. Do I have to bring my own equipment? Even though you very well can bring your own equipment, the facility is expected to supply all necessary protective gear. The only thing that is required for you to bring with you, is a pair of hard toed shoes. 8. Is there anything that should not be worn on a go kart track? Loosely hanging items such as chains or accessories are prohibited. Also any long articles of clothing such as scarfs or trench coats will need to be removed. If your hair exceeds a certain length, you must tie it up or even place it in a cap. Women must not wear dresses or skirts when kart racing. It is completely inappropriate for you to wear high heels, sandals or any type of shoe that has an open toe. Bare feet are completely prohibited, you will be sent away from the facility.